Lauren Loves to Eat: Happy Early Weekend! I'm off tonight for a short trip to New Orleans with my best friends. Ever since my sister brought me a box of Beignet Mix from her visit to NOLA, I'd been dying to try the real thing at Cafe du Monde. 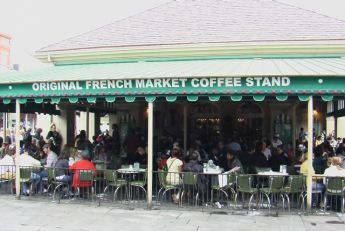 My flight arrives late, but I checked, and Cafe du Monde is open 24 hours a day. Perfect. Image via Man Seeking Coffee.